Operating a single APRS channel on AO-40: Since AO-40 is the primary bird in the AMSAT inventory that provides hemispherical coverage to all corners of the globe for many hours a day, it is reasonable that we establish a permanent APRS channel on the transponder. 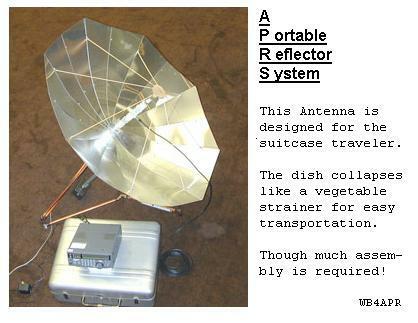 This can serve to link remote travelers back into the global APRS system. This permits live real-time communications between the remote operator and his intended target anywhere on the globe and only he needs the AO-40 portable station. The plan is simple. A net control station (one per continent) establishes a constant PSK signal uplink channel fed from the APRS-IS. This gives users something to tune in and lock on to as shown below. We will use PSK-31 as the modulation mode because of its excellent weak signal characteristics and ready availability to all radio amateurs. (And many other factors discussed later). Then exactly 1000 Hz higher is where the SATGATE station is listening for remote APRS user uplinks. If the DSP software was smart enough, it couild accept multiple uplinks over a range of frequencies offset from the pilot channel. 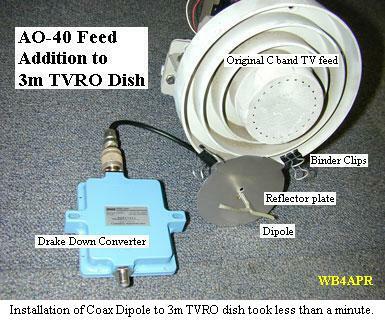 The SATGATE station will take these and then feed anything heard into the global APRS-IS! SATGATE UPLINK: The APRS to PSK-31 conversion will convert all APRS position data (that uses the ALTNET address of "AO40xx") to a simple 6 character gridsquare as shown above. Any PHG is dropped and the course and speed is only included if the station is moving. Otherwise the position comment text comes through as written. Notice that the callsign suffix is repeated as a redundancy check and the grid square is case sensitive to allow for context checking of information validity. PSK-31 has no inherrent error detection, so these techinques allow some rudimentary sanity checking of data that can be Human read and manually entered. Thus the PSK-31 AO-40 user needs no special software to join the Global APRS system. Typically, he would prepare his basic Gridsquare format in one of his transmit buffers to trnsmit at the beginning of any QSO exchange. 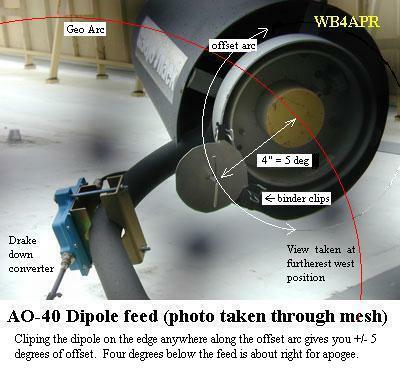 High Doppler: With over 60 KHz of Doppler during an AO-40 pass, there must be a mechanism for the user to be able to find the signal, and to track it. This includes then the mechanism for using a constant offset to identify the exact frequency for the remote user uplink. Weak Signal: With the narrowband DSP signal advantage, the uplink user only needs a modest station to produce a usable signal on the transponder. Low Impact: Operating with weak signals with very little margin above the transpodner noise floor permits PSK operation through AO-40 without impacting other users. Ready availability: Many varieties of PSK-31 software are avaiable and since the user uplink is totally operated in QSO mode with no automatic features, it permits anyone to uplink into APRS without special software or prior considerations. Easy, TV rotator (no elevation) tracking system! APRS AO-40 SATGATE DETAILS: There are several things that the SATgate software should do to facilitate the proper operation of this system. Igating: Captures all APRS-IS packets addressed to AO40xx and passes them onto the SATGATE Pilot channel. Dynamics: If there is not enough APRS-IS data to saturate the uplink pilot, then the pilot channel will recirculate on a decaying algorithm older and older data to keep the channel busy and redundant. But as with any APRS system, as this data ages beyond 30 minutes it must be dropped so as to not violate the netcycle expectations of users. Redundancy: Redundantly repeats all uplink "APRS" data using the original APRSdos algorithm. That is, if a new position is heard from an UPLINK station, that position is injected into the APRS-IS anew. But if not uplinked again, the packet is redundantly repeated on the APRS-IS but at an ever increasing period. Each time it is injected, the period to the next refresh is doubled. This way, new positions only have to be received once to have some redundancy in delivery, but old data will decay out of the system. Messages: The same goes for messages. The SATGATE will acknowledge the receipt of a message either from the APRS-IS or from the UPLINK using the normal APRS process. 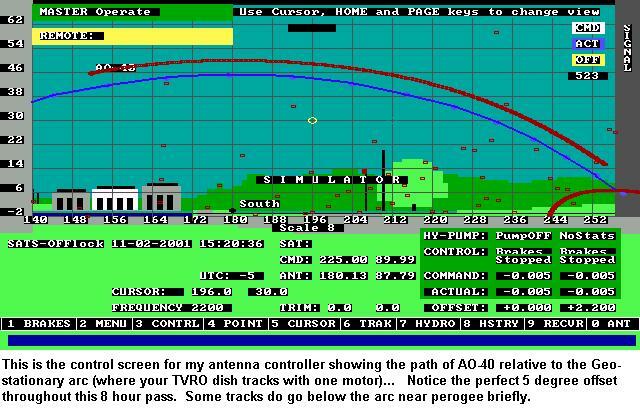 Then it takes over the responsibility and the decaying algorithm to assure delivery via the AO40APRS system. You are visitor number: Since 27 Oct 2003. The Naval Academy does not endorese any project shown here. The purpose of this web page is to show several applications currently in use at this site and should not be considered as an advertisement or an endorsement of any commercial product.